If you randomly ask people in the street of any Western city what is the first typically Chinese food that comes to mind, more than 80% will probably mention noodles. Noodles are indeed China’s favourite snack food. Whenever you feel a pang of hunger, but your next meal is still far ahead, you get yourself a bowl of noodles, from a street vendor, a kiosk type of noodles shop, or another road side cookery. When you then continue to ask what the respondents know about flavouring those noodles, they will undoubtedly reply that it depends on what you put into it. That can be pieces of meat, fish, and a large array of vegetables and spices. That is not untrue. But, what is much less known about professional noodle making in China that the real secret of the cook lies in the broth in which the noodles are cooked. This broth is referred to in Chinese as ‘soup (tang)’. The apex of noodle soup is referred to as lao tang, or ‘old soup’, in Chinese. Why old? Tradition has it that real noodle makers only once start their kettle. Once the broth is boiling, they just keep throwing in noodles and condiments, which, once done, are scooped into a bowl and served to the customer. Some fresh condiments will be thrown on top if, and the noodles are ready for consumption. This process will be repeated for each new customer. Day in day out. In theory, the cauldron can hold soup stretching back years. Tall stories go around in China about noodle makers whose broth has not been changed for more than 100 years. They cook just keeps adding water. This is supposed to create an extremely rich broth. This branch of Chinese cooking has developed a vocabulary of its own. Take e.g. the ‘milky soup (naitang)’. This soup in fact does not use milk as an ingredient. The milky appearance is caused by cooking animal bones for a long time. As applies to the adaptation of other traditional Chinese foods to modern industrial production, the big challenge to redesign Old Soup in a modern setting is to retain the original flavours and textures, while creating a product that complies with the current strict regulations. The importance of old broth can be seen at the Food Ingredients China (FIC) trade fair held annually in Shanghai in March. On the floor dedicated to flavour companies, you will see numerous stands offering instant old soup. That may be a contradictio in terminis, but it is also big business. As soon as you enter that floor, you will be welcomed by the intense smell of the (not so) old soup. Stands will have pans boiling on electric cookers ready to serve you various snacks cooked in that broth. Old soup has already become big business. The leading manufacturer, Lida Food in Henan province, produces almost 80,000 MT p.a. A lot of old soup R&D is going on in China. 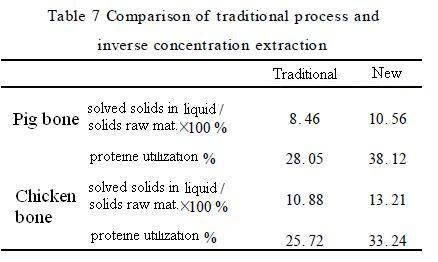 E.g., an interesting study by researchers of the Nanjing Research Institute for The Comprehensive Utilization of Wild Plants apply for processes, slow fire, quick fire, pressurization and enzymolysis, to several types of raw material, to study the dissolution rate and protein utilization rate of pig and chicken bones. This entry was posted in Uncategorized and tagged China food noodles old soup broth chicken pig bone enzymolysis proteine utilization by eurasiaconsult. Bookmark the permalink.